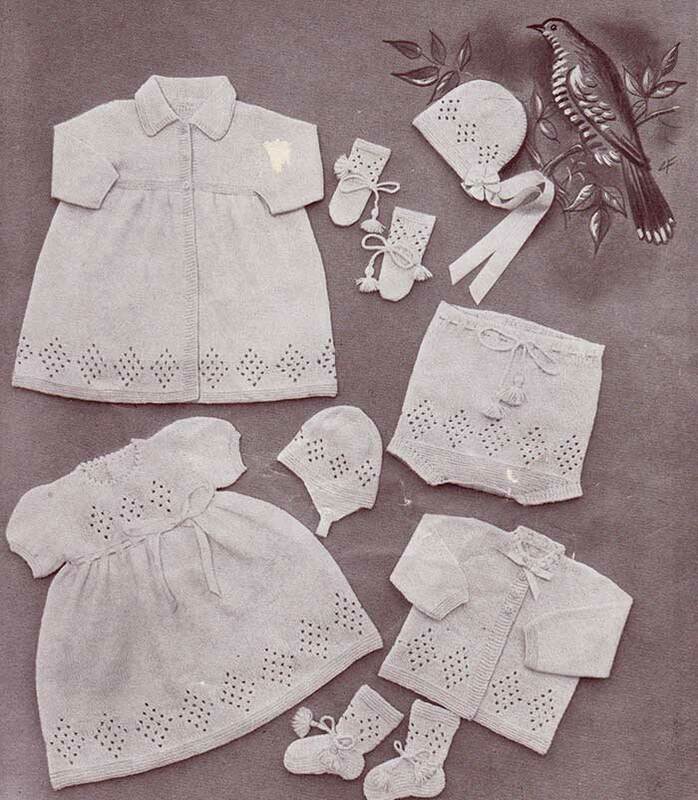 Whilst knitted layettes as a complete set are not as popular as they once were, the individual pieces remain as popular today as in the 1940’s when this pattern was first published. Bonnets and bootees make lovely small gifts for a new baby, and every mum will tell you that a pair of fine wool mittens are a great way to stop brand new babies from accidentally scratching themselves. Of course, there’s no reason you can’t knit a full layette for your favourite baby for a special occasion outfit, or for your favourite baby doll. The original owner of this pattern book marked the lullaby helmet as her favourite easy knit hat for baby boys. I suspect from the notes she made on the pattern that she probably knit quite a few! Made separately: The Frock, 3 ozs/90gm; the Coat, 4 ozs/120gm; the Matinee Jacket, 2 oz/60gm; the Pilches, 1½ ozs. ; the Bonnet, ½ oz. ; the Helmet, ½ oz. ; the Bootees, 1 oz. ; the mittens, ½ oz. 1 pair each Old UK Nos. 10 and 12/US size 3 and 2/Metric 3.25mm and 2.75mm knitting needles. From now on these will be known as “larger size needles” and “smaller size needles”. With the larger needles, 7½ stitches to 1 inch. To fit birth to 3 months. The Front: Using larger needles cast on 128 sts and work 1 inch in garter st (every row k). 1st row: K6, * (k2tog) twice, k12; rep from * ending with k6 instead of k12. 2nd row: P7, * “inc 2” thus: lift the loop which lies between the st just worked and the next one, place it on the left hand needle and k1 and p1 into it, p14; rep from * ending with p7 instead of p14. 5th row: K4, * (k2tog) 4 times, k8, rep from * ending with k4 instead of k8. 6th row: P5, * “inc 2,” p2, “inc 2,” p10; rep from * ending row with p5. 7th and 8th rows: As 3rd and 4th rows. 9th row: K2, * (k2tog) 6 times, k4; rep from * ending row with k2. 10th row: P3, * “inc 2,” p2, “inc 2,” p2, “inc 2,” p6; rep from * ending row with p3. 11th and 12th rows: As 3rd and 4th rows. 13th row: * K2tog; rep from * to end. 14th row: P1, * “inc 2,” p2; rep from * ending row with p1. 15th and 16th rows: As 3rd and 4th rows. 17th row: As 9th row. 18th row: As 10th row. 19th and 20th rows: As 3rd and 4th rows. 21st row: As 5th row. 22nd row: As 6th row. 23rd and 24th rows: As 3rd and 4th rows. 25th row: As 1st row. Now cont in stst until work measures 11½ ins., ending with a p row. Change to smaller needles and dec for waist as follows: K2, * k2tog; rep from * until 2 sts rem, k2 (66 sts). Ribbonholes: * K1, yo, k2tog ; rep from * to end. Work 3 more rows in garter st.
Change to larger needles and work 4 rows in stst. Patt: Next row: Cast off 3 sts, k16, *(k2tog) twice, k8; repeat from * once more, (k2tog) twice, k 19. Next row: Cast off 3 sts, p17, (“inc 2,” p10) twice, “inc 2,” p17. Next row: K2tog, k10, [(k2tog) 4 times, k4] twice, (k2tog) 4 times, k10, k2tog. Next row: P12, (“inc 2,” p2, “inc 2,” p6) twice, “inc 2,” p2, “inc 2,” p12 (54 sts). Work 2 rows in stst. Next row: K9, (k2tog) 18 times, k9. Next row: P10, * “inc 2,” p2; rep from * to last 10sts, “inc 2,” p10. Next row: K11, * [(k2tog) 4 times, k4]; three times, k11. Next row: P12, (“inc 2,” p2, “inc 2,” p6) twice, “inc 2,” p2, “inc 2,” p12. Next row: K13, [(k2tog) twice, k8] twice, (k2tog) twice, k13. Next row: P14, (“inc 2,” p10) twice, ” inc 2,” p14. Cont in stst until armhole measures 2¾ ins on straight. Shape Neck (rsf): K20, cast off 14, k20. Cont on the last 20 sts, dec 1 st at neck edge on next 4 rows, then cont without further shaping until armhole measures 3½ ins. on straight. Rejoin wool at neck edge and work other side to correspond, reversing shapings. The Back: Work as for front until the ribbon holes and garter st band at waist have been completed. Back Opening: Next row: K30, turn and cast on 6 sts (for overlap), Leave rem 36 sts for left side on a spare needle until required. Next row: K6, p to end. Work 2 more rows in stst keeping 6 sts at centre back in garter st as a border. Cont in stst with garter st border until armhole measures 3¼ ins. ending with a right side row. Shape Neck: Cast off 12 sts at beg of next row, then dec 1 st at neck edge an the following 2 rows. Cast off. Rejoin wool at centre back and work to correspond with opposite side, reversing shapings and making a buttonhole in the 5th row (and then at intervals of 1 inch until there are 4 in all) thus: K3, wind the wool twice around needle, k2tog, work to end. On the following row drop one made loop and k the other. Sleeves (both alike): Using smaller needles, cast on 42 sts and work 6 rows in garter st.
Change to larger needles and work next row thus: K3, * k twice into next st, k1; rep from ” until 3 sts rem, k3 (60 sts). Cont in st st until work measures 1¾ ins. Shape Top: Cast off 3 sts at beg of every row until 12 sts rem. Cast off. Made in one piece to commencement at armhole shapings. Using larger needles, cast on 270 sts and work 1 inch in garter st.
Next row: K1, p until 7 sts rem, k7. Now work in diamond patt as for frock but with the addition of 7 garter sts at both ends of work as borders throughout. 1st row: K13, now rep from * of 1st row of frock directions, ending k13. 2nd row: K7, p7, now rep from 2nd row of frock directions, ending p7, k7, instead of k14. 3rd and 4th rows: Work in stst but with 7 sts at both ends in garter st.
5th row: K11, now rep from * of 5th row of frock, ending with k11. 6th row: K7, p5, now rep from * of 6th row of frock, ending with p5, k7. Cont in this way until the diamond patt has been completed. Then cont in stst, with garter st borders until work measures 11½, ins, ending with a wrong side row. Work 9 more rows in garter st, making a buttonhole at beg of 4th row thus: k4, wind wool twice around needle, k2tog, work to end. On the following row drop one made loop and k the other. Note: If the coat is for a boy, make the buttonholes at the opposite end of work. Change to larger needles and work 4 rows in stst with the garter st borders. Commence Armhole Shapings: K37, cast off 5, k68, cast off 5, k37. Cont on last 37 sts for Left Front, leaving sts for back end Right Front until required. Dec 1 st at armhole edge on every row until 32 sts rem, then work without further shaping until armhole measures 3 ins on straight, ending with a wrong side row. Shape Neck: Cast off 10 sts at beg of next row, then work 2 tog at neck edge on every row until 17 sts rem. Work without further shaping until armhole measures 3¾ ins on straight. Cast off. Rejoin wool and work across the sts for the back, dec 1 st at both ends of next 5 rows (58 sts). Work without further shaping until armholes measure same as for front to shoulder. Cast off. Rejoin wool and work the Right Front to match the Left, reversing all shapings and making further buttonholes (as before) at intervals of 1¼ ins until there are 3 in all. 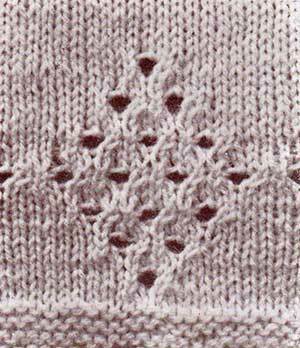 Sleeves (both alike): Using smaller needles, cast on 37 sts and work 12 rows in garter st.
Change to larger needles. Next row: K5, * k1, k twice into next st; rep from * until 6 sts rem, k6 (50 sts). Cont in stst (next row p), inc 1 st at both ends of every 10th row until there are 58 sts. Work straight until the piece measures 6 ins. Shape Top: Dec 1 st at both ends of every row until 18 sts rem. Cast off, working 2 tog at both ends of row. Collar: Using larger needles, cast on 78 sts and work 6 rows in garter st.
Next row: K3, ssk, k until 5 sts rem, k2tog, k3. Work 3 rows in stst, keeping 3 sts at both ends of row in garter st.
Next row: K3, p until 3 sts rem, k3. Next row: K5, * k2tog, k5; rep from * to end (59 sts). Cast off. Using larger needles, cast on 158 sts end work 10 rows in garter st.
Next row: K7, p until 7 sts rem, k7. Now work the diamond patt as for the lower part of coat (with 7 sts at each end of work in garter st as borders) until the diamond motifs have been completed. Next row: K40, k2tog, k74, k2tog, k40. Work 5 rows in stst across all sts, keeping borders correct. Next row: K40, k2tog, k72, k2tog, k40. Work 5 more rows without shaping. Next row: K40, k2tog, k70, k2tog, k40 (152 sts). Cont without shaping until work measures 5½ ins. Commence Armhole Shaping (rsf): K37, cast off 6, k66, cast off 6, k37. Cont on the last 37 sts (leaving sts for back and other front until required) dec 1 st at armhole edge on next 4 rows (33 sts). Work without further shaping until armhole measures 2¾ ins, ending with a right side row. Shape Neck: Cast off 10 sts at beg of next row, then dec 1 st at neck edge on every row until 17 sts rem. Work straight until armhole measures 3¾ ins on straight. Cast off. Rejoin wool to wrong side of sts for back and cont in stst, dec 1 st at both ends of next 4 rows (58 sts). Work straight until armhole measures same as for front to shoulder. Cast off. Rejoin wool at armhole edge of rem sts and work to match opposite side, reversing shapings and making a buttonhole when front edge measures 6 ins thus: (rsf) K4, wind wool twice around needle k2tog, work to end of row. On the following row drop one made loop and k the other. Make 2 more buttonholes at intervals of 1 inch (the last one ¼ inch from neck edge). Sleeves (both alike): Using smaller needles, cast on 37 sts and work 10 rows in garter st.
Next row: K5, * k1, k twice into next st; rep from * until 6 sts rem, k6 (50 sts). Work straight until piece measures 6 ins. Neck Band: Join shoulder seams. Using smaller needles and with rsf, pick up and k 71 sts evenly around neck and work 3 rows in garter st.
Next row: Make ribbonholes: K1 * yo, k2tog; rep from * to end. Work 3 more rows in garter st. Cast off. The Back: Using larger needles, cast on 25 sts and work 4 rows in garter st.
Next row: Make buttonholes thus: K4, * yo, k2tog, k6; rep from * ending row with k3. Cont in garter st inc 1 st at both ends of every row until there are 79 sts. Next row: K, inc 1 st in middle of row (80 sts). Now work in diamond patt as for beg of frock until diamonds are completed then cont in stst until work measures 6 ins up side seam. Shape Back: 1st and 2nd rows: K until 8 sts rem, turn and p until 8 sts rem, turn. 3rd and 4th rows: K until 16 sts rem, turn and p until 16 sts rem, turn. 5th and 6th rows: K until 24 sts rem, turn and p until 24 sts rem, turn. 7th and 8th rows: K until 32 sts rem, turn and p until 32 sts rem, turn. 9th row: K to end of row. Work 7 rows in k1, p1 rib. Make Ribbon holes: K1, * yo, k2tog, p1, k1; rep from * to last 3 sts, yo, k2tog, p1. Work 5 more rows in rib, then cast off loosely in rib. The Front: Using larger needles cast on 31 sts and work 2 rows in garter st.
Cont in garter st, inc 1 st at both ends of every row until there are 79 sts on needle. Cont as for back until side seam measures 6 in. Now work the ribbing and ribbonholes as for back (omitting back shaping) and cast off loosely. work 6 rows in k1, p1 rib, making a buttonhole at the BEG of 4th row (right leg) thus: Rib 4, yo, work 2 tog , rib to end. For Left Leg make buttonhole at the END of 4th row thus: Rib until 5 sts rem, yo, work 2 tog, rib 3. Using larger needles, cast on 78 sts and work 12 rows in garter st, then work 4 rows in stst, keeping 3 sts at each end of rows in garter st as borders. 1st row: K7, * (k2tog) twice, k8; rep from * ending row with k7. 2nd row: K3, p5, * “inc 2,” (see instructions for diamond patt on frock) p10; rep from * ending with p5, k3 instead of p10. 3rd and 4th rows: Work in stst with 3 sts at each end in garter st.
5th row: K5, * (k2tog) 4 times, k4; rep from * ending with k5. 6th row: K3, p3, * “inc 2,” p2, “inc 2,” p6; rep from * ending with p3, k3 instead of p6. 9th row: K3, * k2tog; rep from * until 3 sts rem, k3. 10th row: K3, p1, * “inc 2,” p2; rep from * ending with p1, k3 instead of p2. Cont in stst with garter st borders until work measures 4¼ ins from commencement. Shape Crown: (rsf) 1st row: * k8, k2tog; rep from * until 8 sts rem, k8. 2nd end every alternate row: P.
3rd row: * K7, k2tog; rep from * until 8 sts rem, k8. 5th row: * K6, k2tog; rep from * to end. 7th row: * K5, k2tog; rep from * to end. Break wool, thread through rem sts and fasten off securely. Commence at the Crown: Using larger needles, cast on 8 sts. K1 row and P1 row. 1st row: K twice into every st.
2nd and every alternate row: P.
3rd row: * K1, k into front and back of next st; rep from * to end. 5th row: * K2, k into front and back of next st; rep from * to end. 7th row: * K3, k into front and back of next st; rep from * to end. Cont in this way, working 1 st more between the increases on every alternate row until there are 80 sts on needle. Work 12 rows in stst on these 80 sts, inc into every 20th st on the last row (84 sts). 1st row: K4, * (k2tog) twice, k8; rep from * ending row with k4. 2nd row: P5, * “inc 2,” (see instructions for diamond patt on frock), p10, rep from * ending row with p5. 3rd and 4th rows: Work in stst . 5th row: K2,* (k2tog) 4 times, k4; rep from * ending row with k2. 6th row: P3, * “inc 2,” p2, inc 2,” p6; rep from * ending row with p3. 7th and 8th rows: Work in stst. 9th row: K2tog all along row. 10th row: P1, * “inc 2,” p2; rep from * ending row with p1. 11th and 12th rows: Work in stst. 15th and 16th rows: Work in stst. Now work 2 rows in stst, dec 1 st at both ends of last row (82 sts) . Work 10 rows in garter st.
Next row: Cast off 4, k23, cast off 28, k27. Next row: Cast off 4, then work the rem 23 sts in garter st for ear-flap, dec 1 st at beg of every row until 6 sts rem. (K2tog) 3 times, turn, k3tog and fasten off. Rejoin wool and work the other 23 sts, dec 1 st at beg of every row until 5 sts rem. Cont in garter st on these 5 sts for 2 ins, then make a buttonhole thus: k2, wind wool twice around needle, k2tog, k1. On the following row drop one made loop and knit the other. Work 2 more rows. Cast off. Using larger needles, cast on 36 sts and work 8 rows in garter st.
Work 2 rows in stst, then work in diamond patt as for helmet until the 18th row has been completed. Work 4 rows in stst, then work ribbon holes as follows: K2, * yo, k2tog; rep from * to the end. Cont in stst on these 12 sts for 20 rows then break wool. Now return to the 12 sts left at the right hand side of instep flap, rejoin wool at end of that needle, pick up and k 12 sts along the side of instep flap, k 12 instep sts, then pick up and k 12 sts along other side of flap, k12 (60 sts). 1st row: K1, k2tog, k20, k2tog, k10, k2tog, k20, k2tog, k1. 2nd and 4th rows: K.
3rd row: K1, k2tog, k19, k2tog, k8, k2tog, k19, k2tog, k1. Work another bootee the same. Using larger needles, cast on 36 sts and work 6 rows in garter st.
Work 2 rows in stst, working together every 8th and 9th sts on last row (32 sts). Work ribbonholes thus: K2, * yo, k2tog; rep from * to end. 1st row: K1, ssk, k12, k2tog, k2, ssk, k12, k2tog, k1. 3rd row: K1, ssk, k10, k2tog, k2, ssk, k10, k2tog, k1. 5th row: K1, ssk, k8, k2tog, k2, ssk, k8, k2tog, k1. 7th row: K1, ssk, k6, k2tog, k2, ssk, k6, k2tog, k1. Fold the work in half (right sides inside) and cast off from both needles together. Press work with a warm iron over a damp cloth, omitting ribbings and garter st feet of bootees. Sew in sleeves, easing in fullness around top of armholes. Join side and sleeve seams in one operation. Stitch lap into position at back waist. Work a row of dc around neck, then work a picot edge as follows: * 1 dc into first st, 3 chain, join by dc into the first of 3 chain, 1 dc, miss 1 st; rep from * to end. Press seams. Sew on buttons. Thread waist with ribbon. Join shoulder and sleeve seams. Stitch collar to neck edge from centre to centre of garter st borders. Press seams. Sew on buttons. Sew on buttons at crutch. Thread waist with ribbon, elastic or a crocheted chain. Join back seam and press. Join back seam, gathering up the sts of the crown neatly. Work a row of dc around face and neck edges. Press and sew on button. Thread ankles with ribbon or crocheted chains. Press and thread wrists with ribbon or crocheted chains. The original publication of this pattern is in the public domain. However, this version with modernised terms, additional information for today’s knitters and charts is copyright Sarah Bradberry, September 14th 2013. All rights reserved.